Ever since I was a kid, museums have been a point of fascination for me. I used to beg my parents to take my across the country to a certain museum or explain to my friends in nauseating detail about my favorite museums and exhibits. When it came time to look for an internship in the Fall of 2015, Dr. Baer directed me towards the Gerald R. Ford museum. As a History and Political Science double major, this internship program played to both of my interests while providing important and necessary work experience. Like many people, I had a limited knowledge of Gerald Ford and his rise to the presidency in the mid 1970’s. Working in the museum gave me a hands-on way to learn about President Ford and the historical context of the country he presided over while also learning the technical side of museums. At the museum, I worked as a Collections Management intern under the Registrar, Jamie Draper. Jamie had an extensive knowledge of how museums work, but also knew so much about Gerald Ford and his life. One of my favorite parts of the internship was my ability to openly ask questions anything in the museum and learn so much from Jamie. The main part of my internship consisted of doing behind the scenes work in Artifact Collections. 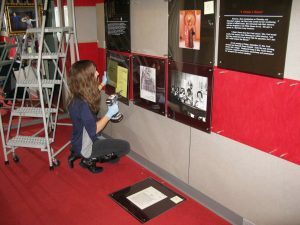 This included basic photography, artifact cleaning and numbering, encapsulation, building custom storage mounts, accessioning, and cleaning up old records. One of my favorite projects included handling a donated collection of over 150 Bicentennial items. This collection included lunch boxes, cooking supplies, pop cans, toys, and other objects celebrating America’s 200th birthday. Prior to working with the artifacts, I had not realized how significant the Bicentennial was for Americans at the time. Jamie helped me to understand that it was important for Americans to celebrate two hundred years of freedom and democracy, especially after the distrust that followed the Watergate Scandal, Vietnam, and a series of economic problems. 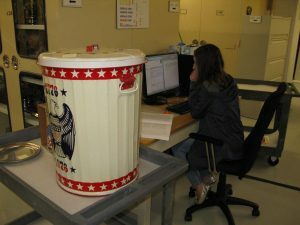 I love the feeling of contributing to the museum’s collection and protecting a part of history. I was also very fortunate to work in the museum during a few exciting times. The ArtPrize competition was happening in Grand Rapids at the beginning of my internship, and I was able to participate in setting up the museum to host the art. I learned how long of a process ArtPrize is, but it was exciting to see how the entire competition comes together. I was also lucky to work in the museum while it closed down for renovations. 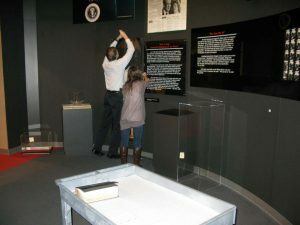 This created a special project for the interns because we helped take down the entire core exhibit in the main part of the museum. This exhibit included artifacts that had not been handled in years like Watergate break-in tools, Betty Ford’s inaugural dress, Nixon’s pardon, and various head of state gifts. Working with these artifacts and experiencing that part of history in a tangible way was certainly an amazing experience. When I started the internship, I was not sure how my education at Hope would apply to the job. I had never worked in a museum, but my job went beyond just technical skill. I worked on researching and writing about artifacts, a job aided by the historical writing skills my professors taught me. When writing about an artifact, I knew how to put it within a historical context. This ability made the entire learning experience richer. This museum internship is a job that I will remember for a long time. I learned so many lessons, skills, and how to balance a school semester and work. Most importantly, however, I learned about Gerald R. Ford and the American presidency. Handling artifacts created a real approach to history, and helped me understand Ford a president, but most importantly, as a human. I was privileged to work with people who understood and cared about the Fords as people, but also cared deeply about history. My supervisor, Jamie, and the curator, Don, taught me more than just the tactical side of museum work, but instilled important lessons about American history that I will be able to use in my future. I am fortunate to have worked under a relatively unknown President, and I hope that I can take this new knowledge and apply to both my History and Political Science majors, as well as teach others about President Gerald R. Ford. If you are in the Grand Rapids area, go check out the newly renovated Gerald R. Ford Presidential Museum!